Daisy received global acclaim for her coaching relationship spanning 6 years with iconic superstar - Madonna. When Madonna lived in the UK - Daisy was her regular trainer. Madonna also rode horses produced and sold to her by Exmoor Eventing. 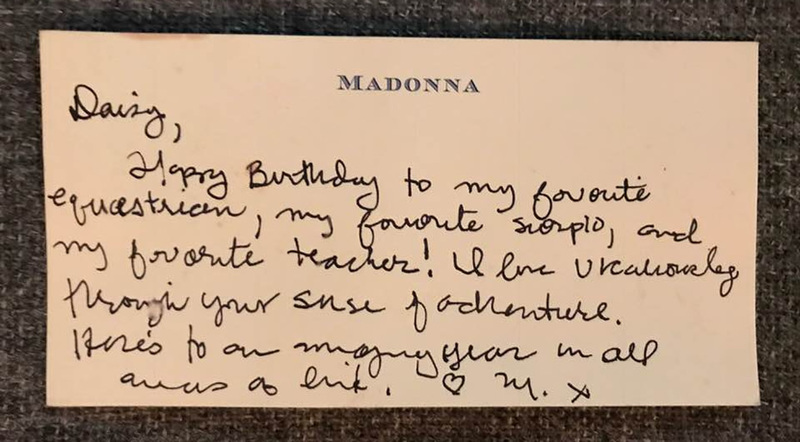 If she can be Madonna's 'favorite teacher' - I'm sure Daisy has something to offer you too! 2018 looks to be an exciting season! Please browse through the calendar - if you would like to join the Exmoor Team at any of the forthcoming events please don't hesitate to get in touch. Daisy is available for show coaching, course walks etc throughout the year. Letchworth Farm is in a truly exceptional location – nestled on the edge of Letchworth State Park the ‘Grand Canyon of the East’. From the farm, we have DIRECT access both into Letchworth Park and onto the Genesee Valley Greenway – the outriding is both peaceful and scenic – it’s truly phenomenal! Onsite we have 90 acres of our own private land, which includes wooded trails, ample grazing, 26 stalls, an indoor arena and a massive (100M x 40M) outdoor ring. There are cross country schooling jumps including water, ditches and banks from beginner to advanced level – many of the jumps have all-weather take offs and landings. Our facility is for hire on select days to outside riders and trainers (it is always open for Daisy's students and our overnight guests) - please consult our calendar or get in touch to schedule a schooling outside of these times - I'm sure we can accommodate you. We operate on an 'access all areas' policy - for a $45/horse day fee you can practice dressage, stadium, XC and use the trials. This fee also applies to overnight guests who wish to use the facility who have not scheduled lessons. We also have a beautiful 1 acre lake – a secluded retreat for a cool off on a hot summers day after a hard days riding, or enjoy your supper lakeside & cook out under stars....swim at your own risk! Boarding and stall rental is available based at the following rates. Client facilities include private bathrooms and showers for primitive campers. To reserve / book stalls please contact us contact us with any inquiries. Copyright 2011 Exmoor Eventing (Horse Sales). All Rights Reserved. Web Design by bpdesign.